Daily Yoga Nidra practice to restore body, mind, and spirit. Lectures to bring about a deep understanding of the Yoga Nidra process. Harness the power of Yoga Nidra to remove emotional and psychic blocks. Initiate life-changing processes from deep within, beyond the thinking mind. Experience a deep, blissful state of being. Practice teaching in a supportive environment. Ample practice time for each student. The Yoga Nidra Training for Yoga Teachers will be based on Yoga, Ayurveda and Tantric texts and scriptures, teachings of Swami Satyananda, Swami Rama and Chitra Sukhu’s own profound discoveries. Upon completion of this deep immersion in Yoga Nidra studies and practice, students will be capable in offering this service to their students and the community, for dealing with stress, addiction, trauma, depression, and insomnia. 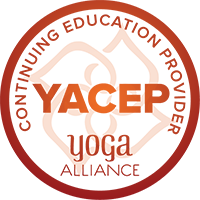 Chitra Sukhu is certified with Yoga Alliance and upon completion of this course, you may apply to receive 41 Continuing Education Credits from Yoga Alliance. 11 hours of Yoga Philosophy, Lifestyle & Ethics. Yoga Nidra, often referred to as “Yogic Sleep,” is the conscious awareness of the deep sleep state. It is an ancient Tantric technique made popular in the West by Swami Satyananda. This simple, yet powerful tool moves you to a state of deep relaxation and has the potential to take you beyond the three normal states of consciousness (waking, dreaming, and dreamless sleep states), to the 4th state of consciousness (Turiya). There are a multitude of physical benefits from practicing Yoga Nidra, including reduced stress, fatigue, anxiety, and worry; a better nights sleep; improved digestion; and increased immune function. Spiritually, Yoga Nidra gives you access to that space between thoughts, beyond mind. In this space we reset the body, expand the mind, and see things from a different vantage point. This allows for the burning or neutralization of Samskaras (deep impressions), the true goal of Yoga Nidra. This is the promise and power of Yoga Nidra. Yoga Nidra is multi-layered in its benefits; as we move through the different layers of our being, through the different Koshas or subtle bodies that overlay our essence, we gain deeper levels of mastery over our lives. This technique has been known to help patients with PTSD, terminal illnesses, mental disorders and other imbalances, physically, emotionally, and mentally. This practice is for everyone, whether you consider yourself healthy or not. Everyone can benefit in some way from the practice of Yoga Nidra. This practice is a great addition to your yoga class. Chitra Sukhu, the daughter of Shri Yogi Hari and Leela Mata, grew up in the many Sivananda Ashrams scattered around the world, and since the age of three has practiced Yoga and meditation daily. She is an experienced Yoga teacher, registered with The Yoga Alliance at the E-RYT 500 level. Chitra has a Diploma in Ayurvedic Sciences from Kerala Ayurveda and is an accomplished Indian classical dancer. 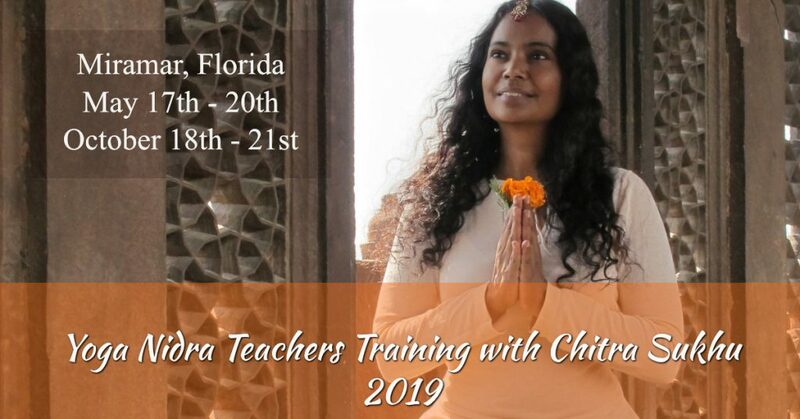 Chitra teaches and leads many retreats around the world for adults and children, and has “birthed” the organization, New Age Kids Inc. — a sincere effort to generate well-balanced individuals with a Sense of Self. She has 10 Guided Meditation and 6 Mantra CDs to her name. Some of her CDs have become part of the Curriculum at schools. They have proven to reduce stress and confusion for children, propagating healthy lifestyle, creativity, happiness and success. She has authored an acclaimed children’s book, “Elven Rhyme – Journey through Time” and a handbook for parents and teachers, “The Way of the Child.” Chitra is now a published playwright with her play “To My Amazement,” garnering praise from recent performances in Canada. Chitra was the first to create the Yoga Teachers Training Course for Youth ages 16-21. Herein, young people can come together to learn more about Higher Consciousness and the Journey of the Self, while becoming Certified Yoga teachers. I had the honor to have a Yoga Nidra course with Chitra last year. 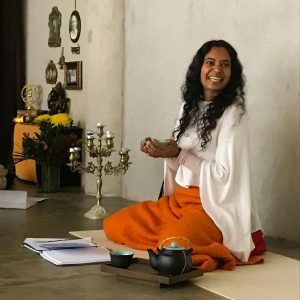 There are no words to express how happy I am with the course: her divine voice, wise and inspiring teaching, the charming and awakening smile, the special energy… When I met Chitra first time at the hotel’s lobby I felt that I knew her for ages, she is such a warm and friendly, deep and amazing person. I did not expect to get so much from this course, it was not only about Yoga Nidra, but it was the Essence of Vedanta, that she gave us such an easy to understand way using a lot of humor and joy! Thanks a lot, Chitraji, I am so happy and blessed to meet you in this life! I recently took a Yoga Nidra teacher training lead by Chitra Sukhu. It was absolutely wonderful and very special. Chitra is a sacred woman who transmits her teachings in a lovely way. I really enjoyed learning from her. She is a powerful teacher that offers so much. Chitra has great knowledge and brings it in a very simple and understandable way. She uses humor and a down to earth approach to bring our spiritual evolution to the next level. A true yogi that will inspire you every minute during her workshops and TTCs. I had the pleasure of studying Yoga Nidra with Chitra Sukhu and I enjoyed every moment of her class. Her teaching style is straight forward, and thorough. She is a warm and caring person and a knowledgeable teacher. She encouraged us to ask questions and probe deeper into any areas we were unclear on or inquisitive about. I left her class feeling excited about Yoga Nidra and inquisitive to know more. I hope this helps someone. Students may leave after this final session, or have the option to stay at the ashram for dinner and overnight if their flight leaves the next day. Breakfast is available the following morning at 10:00 a.m. if students are still at the ashram and waiting for their flights. 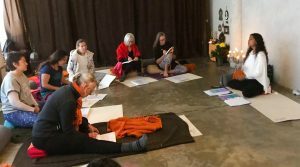 Students must have completed a Yoga Alliance Certified 200-hour Yoga Teacher Training Course before beginning the Yoga Nidra Training for Yoga Teachers. New to the Ashram? Sign up with a friend and save $50 per person.